No doubt refreshed and inspired from Pavement’s 2010 reunion, Stephen Malkmus’s fifth solo LP finds the former Pavement frontman more cohesive and tune- based than 2008’s overblown and indulgent Real Emotional Thrash. Produced by Beck (that other poster boy for US indie- rock slackers), Malkmus’ 15- track solo record – made up largely of accessible, three-minute pop songs – is a welcome return to the sound that made his music so endearing in the first place. Flagship single ‘Tigers’, with its opening line of ‘I caught you streaking in your Birkenstocks’ is more Pavement than Pavement themselves, while the slide guitars on the chorus are equally reminiscent of both Silver Jews and, indeed, Beck’s more roots-based material. 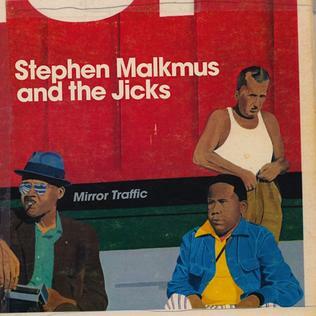 The choice of an experienced songwriter like Beck as producer has certainly paid off; throughout, Malkmus shows his range as a songwriter. ‘Senator’ is a reminder of Malkmus’ lyrical skills as a ribald social critic of Middle America, while ‘Asking Price’ and ‘Fall Away’ are amongst the most tender and accomplished songs that Malkmus has ever written. Beck’s presence throughout the record is there, both musically and in spirit. The jaded folk / country of ‘No Is (As I Be Are)’ and ‘Long Hard Book’ could have easily been taken from the producer’s own Mutations, while the instrumental ‘Jumblegloss’ seems like a musical exercise between both artists. Although it might be three tracks too long and the second half lacks the punch of the first, Mirror Traffic will no doubt appeal to those currently caught up in a nineties nostalgia trip and is certainly Malkmus’ most enjoyable and infectious set of songs as a solo artist.